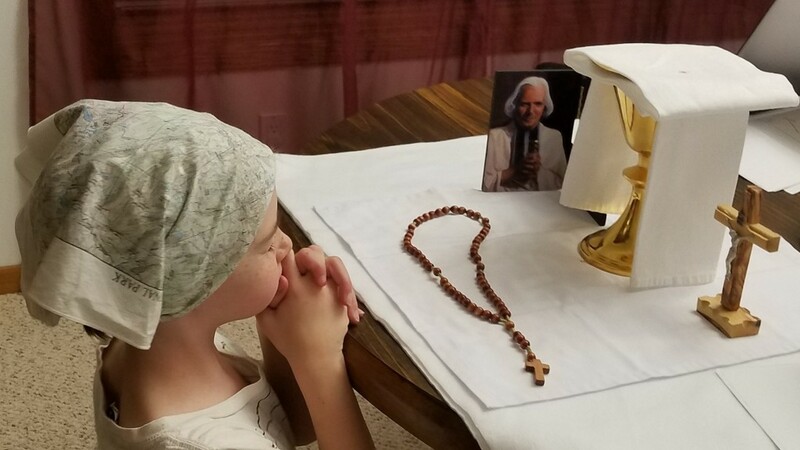 The purpose of the Traveling Chalice program is to encourage everyone to pray and promote vocations to the Priesthood, Diaconate, Married and Religious Life. The consecrated Chalice is used as a focal reminder of Christ's body and blood as central to our faith and the role of our priests at Mass. The chalice aids us in focusing our prayer time for this special intention and need in the Diocese of Rapid City. Each week at Mass an assigned family will receive the wooden chest the chalice and paten are housed in. The family then takes the chalice home and places in a place of honor to pray daily during the week for an increase of vocations. The beautiful handmade box the chalice resides in is thanks to George Miller. The chalice was presented to Fr. Andrzej Wyrostek by the Knights of Columbus. Sign up to host the consecrated Chalice in your home by calling Joni at 787-5168. Assist us in building a culture of vocations, creating an environment where all disciples will seek your will for their lives. May our lives "attract and form intentional disciples who joyfully, boldly and lovingly proclaim and live the mission of Jesus Christ our Lord. Amen.